The Great Canadian Theatre Company (GCTC) , located in the wonderful Irving Greenberg Theatre Centre at the corner of Holland and Wellington, is Ottawa’s largest professional, independent theatre. The second show of the 2018-19 season, The Drowning Girls, runs from October 23rd to November 11th, 2018. UPDATE: November 12th, 2018 – The Drowning Girls run has come and gone but there’s lots more theatre where that came from! If anyone needs a different bike route to the GCTC other than the one described below, send me a start cross street and I’ll figure one out. The blue line on the attached map indicates a bike route patrons can follow to get to the GCTC from the Central Park neighbourhood located south-west of the theatre. This route may also serve riders arriving from points further west along the Experimental Farm Pathway as far as Woodroffe Avenue, as indicated by the pink line. From our starting point we head east along the Experimental Farm Pathway between trees and houses before crossing Merivale Road at the lights. The path then continues downhill past corn fields on the right towards Fisher Avenue. The crossing at Fisher is a little convoluted as the lights are located a short distance south. Unofficial bi-directional bike lanes have recently been added along the west side of Fisher to get to the crossing. Once across Fisher the Experimental Pathway heads north. The path then takes a sudden turn east. To continue north, exit the Experimental Farm Pathway immediately beyond the turn, onto a path of packed dirt that runs parallel to Fisher through a section of beautiful tall pines. This path eventually meets the paved pathway running along the National Capital Commission (NCC) Scenic Driveway. Continue north along this path. If it’s rainy the path through the woods can get a bit muddy. An alternative is to take the bike lane on the paved shoulder along Fisher to where it ends at Tunis Avenue. Turn right onto Tunis, then left along the NCC pathway. 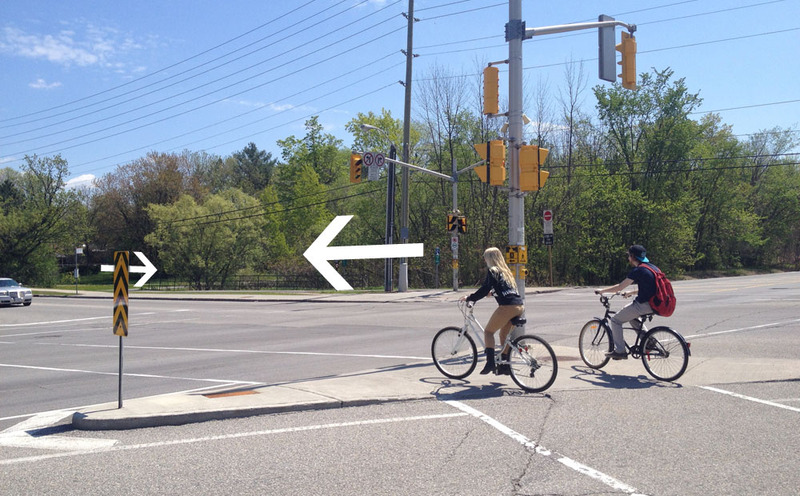 The NCC pathway crosses Fisher at some traffic lights, then ends a short distance further north at Carling Avenue. Cross Carling at the traffic lights, then again across Island Park Drive to get to the bike lane that runs north along Island Park Drive. Follow Island Park for a short distance before turning onto Huron, just before reaching the big NCC sign. Continue north along Huron before turning right onto Kenilworth, both pleasant residential streets. Cross Holland Avenue at the traffic lights and continue along the bike path under the Queensway. Cross Holland at the lights just north of the Queensway into the grounds of Fisher Park Public School. One may be tempted to continue down Holland, versus crossing through the school yard to Harmer Avenue North, but the Holland bike lane disappears further north of and it all turns into a hornets nest of non-allgned intersections with cars and trucks jostling their way on & off of Holland. In two years one will be able to avoid riding along Holland entirely once the city has finished replacing the pedestrian/cycling bridge over the Queensway linking Harmer Ave North and South. Stay to the right of the school and follow the path that circles the playing field, then exit onto Harmer Avenue. Once arrived at Harmer on the other side of the schoolyard, continue north, then cross Byron Avenue to get onto the multi-use path. Ride along the Byron multi-use path 1 block over to Huron Avenue (another quiet residential street), then continue to the corner of Huron and Wellington where you will see the GCTC marquee one block to the east. There are a bunch of bike racks along the Wellington sidewalks between Huron and Holland. There are also a few racks along Wellington closer to the theatre. The University of Ottawa Bike Co-op is a great big work space with stands, tools, and on-site expertise to help you fix your bike. It’s free for undergraduate students and a mere $5 annual membership for everyone else. Lots more info can be found on their website, including hours, by clicking here. The tricky part is getting there, as it’s tucked around the back of the Lees Avenue Campus building. Here are a couple of routes to get there, starting from the main campus on King Edward Ave. The first route (blue line) is more direct and accessible in the winter, while the second is slightly longer route (purple line) but is much more picturesque, taking advantage of the Rideau River Western Pathway. It also avoids a couple of testy traffic spots encountered on the first route. Both routes start off from the entrance to the main campus at the intersection of Marie-Curie and King Edward Ave. I crossed King Edward and headed straight down Somerset St East. There are bike lanes along Somerset which dissapear intermittently for a couple of blocks, then re-appear at the bottom of the hill. I turned right onto Chapel St, a quiet residential street. Turning right off Somerset East onto ….. Chapel St.
At Wiggins Private I crossed onto the sidewalk on the left hand side which becomes a multi-use pathway after a few meters. I continued along the pathway as far as the signalised lights across Lees Ave. For some strange reason the bike lane along Lees starts a few meters beyond the crosswalk so I made sure I had time to cross and get to the bike path before the light changed. Lees Avenue curls over the Queensway before reaching the traffic lights heading onto the Lees Avenue campus. I rode into the campus, past the front entrance to the main building. I then turned right onto the path between the building and the Gee-Gee’s football field. I continued around to the back of building to where the path joins the Rideau River Western Pathway. There you will notice some spray painted signs in the window facing the path indicating you’ve arrived at the Co-op. I continued around the corner to where the entrance door is located. There are no signs identifying this entrance, but there is a track on the side of the stairs to help push your bike up the stairs. Around the side of the building… to the entrance with the bike ramp. Once through the exterior doors there is a sign pointing to the Co-op. And quite the Co-op shop it is. An alternative to riding around the building is to enter through the main doors of the Lees Avenue Campus building and push your big through the hallways to the Co-op shop. This second route starts at the same location as the first route and similarly heads down Somerset, however rather than turning onto Chapel, it continues along Somerset all the way to Strathcona park on the edge of the Rideau River. I took the path leading straight into the park, then turned right along the Rideau River Western Pathway, rather than over the Adawe Bridge (the one with the silver sphere sculptures). It’s a very pleasant ride along the Rideau River Western Pathway. The path goes under the Queensway and up beside the Gee-Gee football field to the Co-op with the signs in the window anouncing you’ve arrived. Et voila! If anyone needs a different route to get to the co-op please send me a starting point and I’ll figure one out for you! Last summer the City of Ottawa posted a series of self-guided bike tours with the goal of encouraging cyclists to explore the countryside within Ottawa’s limits and surrounding areas. I’ve been meaning to visit a few sites in and around Osgoode so I decided to try out The Osgoode Ride. The city rates this 59km route as ‘experienced’. I’ve gone on many rides of varying difficulty within Canada and abroad so I figured I qualified. On Saturday morning I gave it a shot. Here’s how it went. I set out from the parking lot off Mitch Owens Road on the edge of the converted rail-to-trail Osgoode Link Pathway. This parking lot is conveniently located right beside The Wood Source where they have a great selection of types of wood not available in most lumber yards. 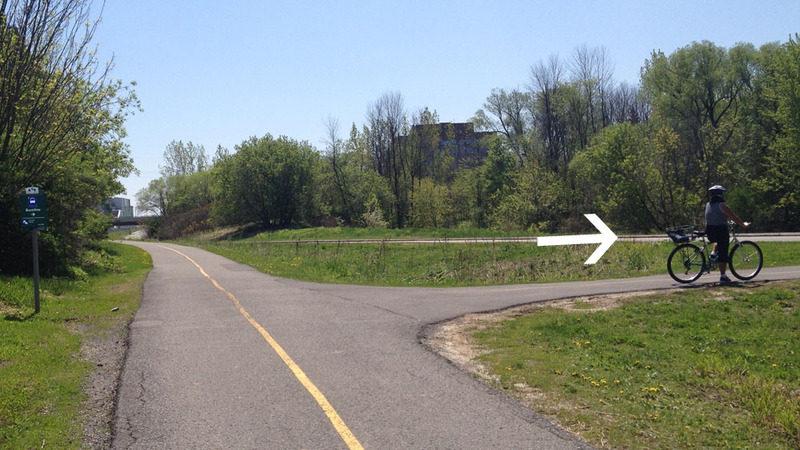 I rode south along the Osgoode Link Pathway and turned left onto Gough Road to get onto the city’s recommended route. The majority of this route runs along two lane straight-aways in various states of repair, from crumbling asphalt to fresher pavement. Most of the shoulders are a mix of loose and packed gravel. I’m guessing the linear directness of these roads are what encouraged most drivers I encountered to push the pedal to the metal, regardless of the condition of the roadway. Tragically, last September alone there were two fatal collisions along this route, one at the intersection of Pathway Road and 8th Line Road, the other along Dalmeny Road. If there wasn’t any traffic coming in the opposite direction most drivers generously moved way over to the opposite lane to pass. There were a few instances that required bailing out onto the gravel shoulder in hopes of survival. For example when this oncoming driver chose to move into my lane to pass another car. There are only a few small hills on this route. When they did appear, drivers were loathe to move over when passing me lest an unseen vehicule be cresting the hill in the opposite direction. The proper thing to do is wait until you are over the hill and sight lines are clear to safely pass, but this was not a popular option for some, like this guy who could be heard accelerating from a long ways off, making it quite clear he had no intention of slowing down as he flew over the hill. Another common circumstance that often necessitates taking to the shoulder is when a vehicule insists on passing even though the timing coincides with another car approaching in the opposing lane, leaving minimal or no room beween the passing car and the edge of the road. This was paticularly common along Victoria Street where traffic was busiest. Having a mirror is essential in these circumstances to be able to guage how close the encounter was lining up to be, and to assess the size of the vehicule coming up from behind, particularly in communities that often rely on wider than average vehicles as their mode of transpo. The need to always be prepared to ride onto an unpredictable gravel shoulder in a moments decision means I don’t consider this route to be safe for cycling. To do so there would need to be paved shoulders to provide riders with a safe means of escape in such dangerous situations. There are a few instances along this route where there are paved shoulders, such as when entering Metcalfe, and a short section where Dalmeny Road road turns onto Gordon Murdoch Road. Optimally every road should have a paved shoulder or, at a minimum, along bike routes recommended by the city, similar to those along Albion Road and other roads frequented by cyclists near the airport. The intitiative to encourage cycling through the countryside is admirable. It provides a boost to local economies, like at the vegetable stand I visited along the route and at the Metcalfe Farmers’ Market . It also allows for wonderful healthy outings for residents and tourists alike. But without proper infrastructure, routes such as this will remain accessible to only the most foolhardy of cyclists. Build safe bike infrastructure and they will come. Don’t and they won’t. I only saw 4 other cyclists on the roadway portions of this route whereas along the Osgoode Link Pathway I encountered over 15. I leave you with a few fine discoveries made along the route. Biking to Strathcona Park, where there’s a whole lotta theatre going on! Strathcona Park is a picturesque tract of greenery that runs along the west bank of the Rideau River at the eastern edge of the Sandy Hill neighbourhood. One can meander along a network of paths, past big old trees and features like the Strathcona Fountain sculpted by Mathurin Moreau , donated by Lord Strathcona in 1909, or the unique play ground structure designed by artist Stephen Brathwaite that incorporates carved blocks of stone recovered from prominent Ottawa heritage buildings. Strathcona Park is also the staging ground for professional theatre throughout the summer! Odyssey Theatre has been performing Italian commedia inspired productions there since 1985. This is the opening weekend of their production Lysistrata and the Temple of Gaia. A Company of Fools, Ottawa’s longest running professional Shakespeare company, performs their travelling show in the park every Monday evening throughout the summer. This year it’s the Bard’s comedy Twelfth Night you can catch them there, and in various other parks around the region for the rest of the week right up to August 18th. UPDATE- September 2018: Another fine season of theatre has come and gone, but fear not! Next summer promises to once again be the staging grounds of more wonderful productions by Odyssey Theatre and A Company of Fools! With the 2015 opening of the Adawe Bridge over the Rideau River, Strathcona Park became much more accessible to cyclists from points east. This route explores how to get there from the west, starting in Centretown. The purple line is an alternative deviation on the return trip to avoid having to ride amongst traffic on Laurier, as the west bound segregated bike lane only starts at Elgin. If anyone needs a different bike route to get to Strathcona Park let me know & I’ll figure it out. We begin our journey at the western end of the Laurier bike lane at the intersection of Laurier & Bronson. Head all the way east along the Laurier Bike Lane to where the path passes infront of City Hall after crossing Elgin Street. Just before Laurier heads over the canal, turn onto the sidewalk along the exit to Queen Elizabeth Driveway. Just a few feet along the sidewalk it becomes bi-directional shared pathway. Cross Queen Elizabeth Driveway at the 4 way stop and head south along the Rideau Canal Western Pathway. Not too far along you will see the Corktown pedestrian/bike bridge to your left heading over the canal. Cross it. Exit off the Rideau Canal Pathway onto the Corktown Bridge – follow that guy. Continue down to the signalised crossing at Colonel By Drive and ride under the transitway and up along the winding path to the Ottawa U campus. Ride straight ahead along Marie Curie Private and across King Edward Avenue at the lights. Head straight on down the hill along Somerset St East. Bike lanes appear a couple of blocks past King Edward that lead all the way to Strathcona Park. Entrance to Strathcona Park at Somerset St East. Odyssey Theatre’s performances are at the northern end of the park, while The Fools set up a little closer to Somerset, as indicated on the above map. I’ve also spotted the location of the Strathcona fountain and the Brathwaite play structure on the map. Author ottawaveloPosted on July 27, 2018 September 2, 2018 Categories Art & Architecture, Public ArtLeave a comment on Biking to Strathcona Park, where there’s a whole lotta theatre going on! Biking to the Bells Corners Pop-Up Bike Lane ! Updated – July 23rd, 2018: On Sunday, July 22nd there was a pop-up bike lane installed along Moodie Drive in Bells Corners for cyclists to try out. The Healthy Transportation Coalition was behind this great initiative which you can read more about by clicking here. An important part of their goal is to demonstrate the need for safe cycling infrastructure on Moodie Drive in Bells Corners West. Here’s a bike route for those located closer to downtown who are interested in riding out to Bells Corners! The purple line indicates the location where the pop-up bike lane was installed. As the event landed on a Sunday, the first section of this route capitalised on the weekly Sunday Bikedays event when the Sir John A Macdonald (SJAM) Parkway westbound lane along the Ottawa River is closed to traffic, starting from the War Museum and continuing all the way west to Carling Avenue. SJAM Parkway is re-opened to cars at 1pm on Sunday Bikedays, so the orange line on the map proposes an alternative return route from the Pinecrest Creek Pathway that is primarily along the Experimental Farm Pathway. Or one could ride along the Ottawa River Pathway that runs parallel to the SJAM Parkway. Just before Carling there is an oppportunity to get onto the Pinecrest Creek Pathway just off the SJAM Parkway exit. The path goes under the Queensway and up to Iris St, then continues on the opposite corner of Iris, like so. Further along there is a path off to the right. There is a sign (barely visible on this photo) pointing to it that reads ‘Baseline’. If you miss the turn off and wind up by the fire station on Woodroffe you’ve gone too far. ‘Is that arrow still following me?’, thought Carla as she paused to wait for her partner to take another picture. Craig Henry Drive has a painted shoulder but it is not signed as a bike lane so there is a chance you may have to bike around the odd parked car. Follow Craig Henry Drive all the way to Greenbank Road. On the opposite side of Greenbank continue along Canfield Road for a short distance before hopping onto another path. To access this path take the closest cut in the curb which is a few yards away from the start of the path, infront of some communal mailboxes. Once arrived at Bruce Pit turn right and follow the packed stone dust path that circles the Pit. Cross Cedarview Road on the west side of Bruce Pit and then ride along the bridge, that has bike lanes, over the 416 highway. Once on the other side of the 416 cut through to the northwest corner of Bell High School campus. Just beyond the black chain link fence there is a short path off to the right that leads down to Stinson Avenue. Stinson Ave is a quiet residential street, as are Delta St, Evergreen Dr, Ridgefield Crescent, Longwood Ave, Tanglewood Dr and Hadley Circle which I followed as per the above map all the way to our final destination on Moodie Drive. Author ottawaveloPosted on July 19, 2018 July 24, 2018 Categories UncategorizedLeave a comment on Biking to the Bells Corners Pop-Up Bike Lane !